Several months ago I decided to purchase a set of Bluetooth headphones so I could, on occasion, watch TV in the bedroom late at night without disturbing my wife. At one time I had a wireless headphones set that worked well for this purpose but they were simply very bulky (both the charging unit and the headphones themselves). I attempted to use a jail-broken iPod as well but I wasn’t satisfied with that either. The TV itself doesn’t support Bluetooth so I decided to purchasing a Bluetooth audio transmitter. 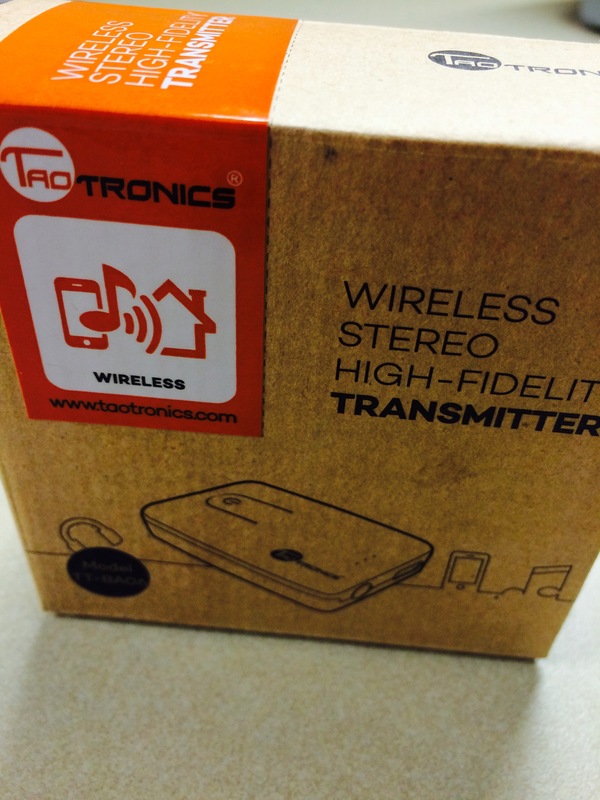 In this case, one manufactured by TaoTronics, which is small and reliable. Overall the device is very good but there is a slight delay in the audio that is noticeable relative to the action on TV, especially with dialog, though I grew accustomed to it rather quickly. A couple of months ago I had the idea to see if there was a simple way to play iTunes music from the built-in iMac speakers while also playing it through a Bluetooth speaker (in this case a JBL speaker). My goal was to have the music playing from the computer in one room and also playing from a Bluetooth speaker in the dining room. Sure enough, OS X has a way to do this (I’m running 10.9 so I don’t know how widely this feature is supported across older versions of OS X). Thanks to user Eric Ross in the Apple Support Communities I didn’t have to do much searching to find the answer. As detailed in his response, the solution is to open the Audio Midi Setup application located in the Utilities folder and then simply create a Multi-Output Device that has both speaker types selected. 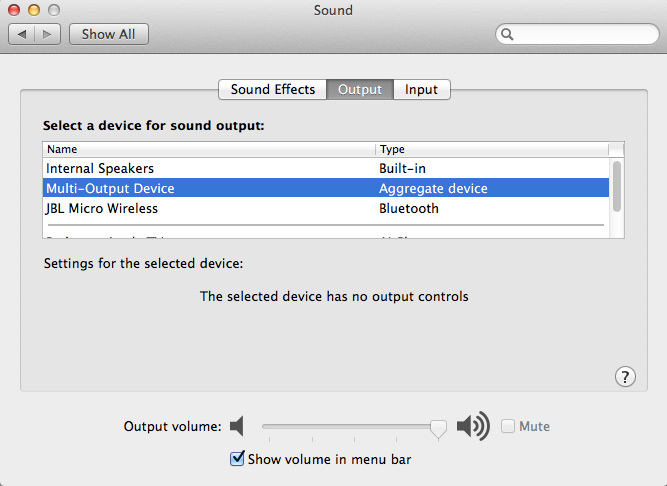 Note that in order for this to work the Bluetooth speaker needs to already be connected to the Mac. I originally did this with my iMac but the screenshots in this post were created using my MacBook Air. And that should work. 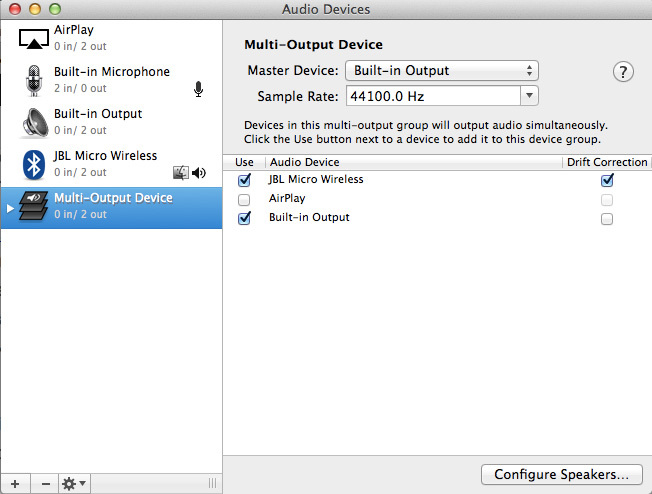 The Bluetooth audio (at least with the settings I used) will have a slight delay in comparison to the system speakers. Bluetooth has a relatively short range so the practical applications of this method may be limited by obstructions within one’s home and the receiving capability of the Bluetooth device that is used. I’ve had a wireless headphone set for a couple of years, which I use to listen to TV late at night in our bedroom. The set has worked great but we recently rearranged some areas of our house and though I like the headset the charging base took up a lot of space on the mantel and its cables added to some additional clutter. 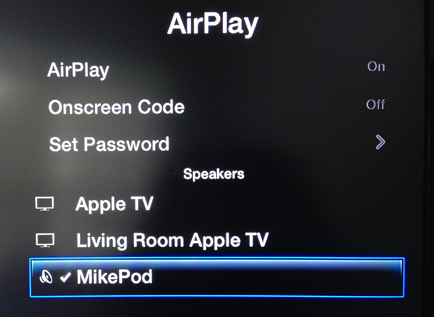 Rather than put the wireless set back in place I decided to go a different route and instead use a relatively-unused iPod touch as an Airplay speaker for the Apple TV in the bedroom. Last weekend I made a couple of purchases for the living room, which I’ve been planning for a while. One of these purchases was a Toshiba Blu-ray Player (BDK33). We’ve been able to watch Blu-ray movies on the PS3, but it’s in a different room and I’ve been wanting to be able to also watch Blu-rays in the living room (the other room has a larger television but it’s currently lacking comfortable furniture). I looked at several different models in Best Buy and Target. I didn’t bother with checking Wal-Mart this time. I was surprised to find a real deal in Best Buy. It’s rare that they have anything, aside from movies, that I would purchase there. I considered it a good deal because it has wifi capability built-in (unlike many that are “wifi ready”, meaning you’ll need some kind of adapter to use them on wifi). It also supports Netflix, Hulu, and some other services. I was actually just looking for a plain Blu-ray player without those bells and whistles. After all, I already have an Apple TV in the living room. The price convinced me to go ahead and get it. 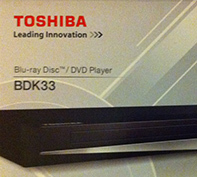 Sometimes it’s difficult to find a regular Blu-ray player even for $59. So far I’ve been happy with the purchase, though I haven’t used it much. We’ve only watched a single Blu-ray movie and though I do have it on the wifi network I haven’t tested Netflix or Hulu. It’s connected to my older 32″ TV via the HDMI switch. The movie played without any problems and it looked great on my older HDTV. A while back I purchased an Apple Airport Extreme Base Station to serve as our primary router and wireless access point. Though initially impressed, I learned that this expensive device wasn’t capable of fully permitting incoming PPTP VPN connections. 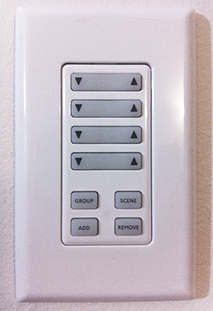 In addition, it didn’t provide many configuration options. To work around this problem I purchased an ASUS wireless router and instead used the Airport as a wireless access point. The final work-around resulted in two network devices where one could have worked just fine (I continued to use the Apple Extreme instead of only the ASUS wireless router because the Apple device offered better wireless range). I wasn’t thrilled with this setup and wireless covered was still lacking so I added a new device to my wishlist for Christmas, which I received. 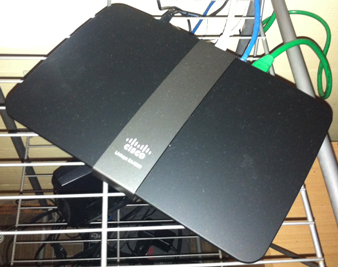 We’re now using a Linksys Smart Wi-Fi Router N900 Media Stream (EA4500). I was impressed with this model beforehand when my in-laws changed their router to one of these and I had a chance to work with it a bit. Since setting up our router I’ve removed the ASUS wireless router and the Apple Airport Extreme Base Station. There are several features I haven’t used yet such as the ability to connect an external hard drive. The following are a few things I’ve learned about this router since installing it. One of the items I received for Christmas was another Powermat. The first kit I purchased can only charge my iPhone but this kit can charge two devices at the same time. It also includes a wireless charging adapter that can be used with nearly any USB device with the included adapter tips. The kit is great and so far seems to work without any issues. Placement of the iPhone is a little different. The other charging kit is practically form-fitted so the case fits in easily. On the larger charging mat it takes slightly more work to place the iPhone properly but it doesn’t take long to get used to figuring out the proper alignment to charge. It does suffer from the same issues the other Powermat has – annoyingly bright LEDs (to indicate charging) and the sounds that it makes when the mat begins to charge a device. Those issues aside it’s excellent. I like the convenience of not having to plug and unplug every time I want to charge – this should help prolong the life of the connectors for when I do need to charge with a cable. Overall, I’m really enjoying this gift. One of the reasons I wanted it was so I could also charge my first-generation iPod nano, which it does. It’s also capable of charging my 3DS with the extended battery.